Clubfoot is a complex deformity of the foot caused by the abnormal development of a baby’s bones, ligaments and muscles while in the womb. A foot that is “clubbed” will be twisted inwards and downwards. The foot will be shorter than an unaffected foot and the calf muscles of the affected limb will be smaller. Around the world, 150,000–200,000 babies with clubfoot are born each year. Approximately 80% of these will occur in low and middle income countries. What if we don’t help? 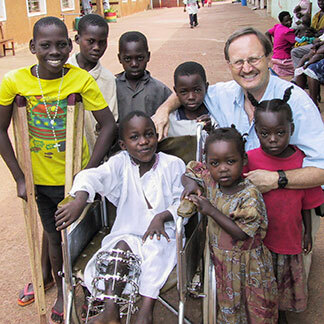 Without treatment, clubfoot causes a lifetime of disability and loneliness. With each step a child will experience pain and difficulty walking. Too often these children are left out of games and social activities. They have a hard time getting to and staying in school. Adults with clubfoot have difficulty getting a job. Clubfoot treatmeant utilizes a non-surgical procedure known as the Ponseti method, a specific method of manipulation to stretch contracted ligaments, tenotomy (under local anesthesia), bracing, and follow-up visits. The Ponseti method must be started when the child is still young – ideally between a few days to several months old. Generally, the earlier treatment is started the easier a clubfoot is to correct. Gentle, weekly manipulation and stretching of the foot in order to correct the deformity. Each time the foot is manipulated it is put into a long-leg plaster cast with the knee bent to 90 degrees in order to hold the corrected position, usually for one week. This takes 6-8 weeks. The downward position of the foot, caused by a tight and shortened Achilles tendon requires a small corrective surgery in almost all cases. This procedure is a complete tenotomy (the surgical cutting) of the Achilles tendon which can be carried out under local anaesthesia. Immediately after the surgery a final cast is applied in an over-corrected position for a further three weeks. Bracing using a Steenbeek Foot Abduction Brace is started as soon as the final cast is removed. Braces must be worn 23 hours/day for three months following treatment and then 11 hours/day (while the child is sleeping at night) until the child is four years old. Why a National Clubfoot Program? By partnering with local governments and churches, training existing health care practitioners and birth attendants, linking with local orthopaedic experts, and by raising awareness of clubfoot among the local populations, we can identify cases of clubfoot at birth or in the first weeks following birth. The first National Clubfoot Program was piloted by Hope and Healing International’s Dr. Norgrove Penny from Victoria, BC, and Hope and Healing International’s physiotherapist, Michiel Steenbeek – (who also designed the Steenbeek Foot Abduction Brace) and Dr. Shafique Pirani of the University of British Columbia. This first program was in Uganda and was started in 1999. Today, 35 developing countries have implemented a National Clubfoot Program. Dr. Norgrove Penny, orthopaedic surgeon, Hope and Healing International medical advisor and appointed member of the Order of Canada. Hope and Healing International and CURE Clubfoot, in partnership with the Ministry of Health, Butembo-Beni Diocese and Heal Africa in Goma. After Pascal was born, Riziki knew something was wrong. She told me that only four days after giving birth, she noticed one of his legs was weak.